Last night, my friends and I celebrated the arrival of Animaniacs on Netflix by binge-watching over tacos. It was nice to see how most of the show still holds up after over two decades. That said, nothing is without sin. And the biggest sin in this show’s record, at least in my mind, is the teenage terror that is Katie Ka-Boom. The entire premise of the Katie Ka-Boom segments is that Katie is a teenage girl who loses her mind with every minor social misstep or foible. The twist in this cliché is that she transforms into a series of grotesque monsters based on the stressor of the day which ultimately result in the terrorization of her family and destruction of the house – usually through a massive explosion; hence her name. There is a germ of a good idea here that could have been made into a passable laugh, but there is no variation to the theme. They even reuse the same lines and gags. It’s just incredibly lazy writing. There are many sins one can commit in entertainment, but not being funny in a comedy (or not entertaining in any regard) is the worst because it can only bring the other problems into clearer view. There are two things we praise Animaniacs for consistently; it’s desire to treat it’s younger audience as intelligent, critical people and it’s progressive depiction of women. 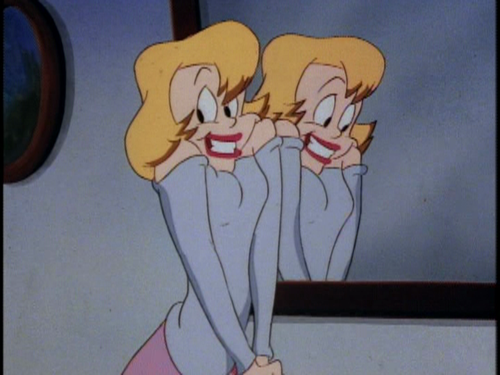 As for the women of Animaniacs, they had a knack for independence and proving their capableness in hard times. Even blatantly sexualized characters like Hello Nurse and Minerva Mink demonstrated amazing intellect and cunning; proving they had the brain to complement their beauty. So, imagine how much of a kick in the head it is to see a character like Katie who basically says that all teens – especially teen women – are irrational, emotionally unstable, sub-humans. Let’s cut through the crap and get to the big point; this is the story of a spoiled rotten child oppressing and controlling her family through violence in order to get everything she wants. You know what we call that in the real world? DOMESTIC ABUSE. Yes, in a world of whimsy and cartoon antics, there exist abuse victims. There was one episode in particular (the clip of which I sadly can’t find online) that demonstrated this shockingly well when, for a brief moment after being corrected by Katie, her mother quickly recoils back in fear with arms raised saying, “my mistake.” Speaking as someone with a minor background in psychology, such actions and hyper-awareness in social situations are clear symptoms of an abuse victim. If the show just had a passable exaggeration beyond the supernatural powers, it could have played itself off as a dark comedy. But, as we have established, Katie Ka-Boom is NOT funny; she’s evil. Like, the ‘monster-that we-need-The-Avengers-to-fight’ kind of evil. Wow, I feel that it was Katie Ka Boom who wrote this. Just wait for it Katie, maybe one day you’ll get it. Really? I felt I made a reasoned argument and could have been WAY more angry than I allowed myself to be. I’m not exactly being “I’m right because screw you” here. Anyway, it’s not like I’m insulting people who liked the segment. If you enjoyed it, that’s your thing. That said, I was personally bored with it as a kid and I’m eye-rollingly disgusted with it as an adult. I think you missed the point in that she’s an over the top exaggeration of a teenage girl blowing up over the smallest things. If your going to over think this stuff then you might as well call locking the Warner’s in the water tower child abuse. The best art holds up when you analyze it closer than the artist intended. For instance, if you were to read a child abuse allegory in the Warner’s, you’d quickly realize that they always get comedic justice – usually by annoying their tormentors into submission. That’s where their humor lies; making bad things happen to people who deserve it to illustrate why they are bad people. Katie never receives any comeuppance for her behavior. Her innocent family suffers and we’re meant to laugh it off because, “she’s a teenager.” And it’s that same unfunny, misguided, and ill-informed exaggeration in every episode. It’s basically the “It’s A Good Life” episode of The Twilight Zone if it told you to laugh every time someone is terrified of Anthony. I think you’re taking this way too seriously. I don’t like Katie kaboom either, but I don’t think she’s supposed to be a representation of every teenage female. I’ve always believed that the best entertainment all holds up when you bring a finer lens to study it then the artist may have intended as it brings up information you might have missed the first time. So, not taking an analysis seriously would be in direct defiance of my personal code. What’s more, audience interpretation is as much a part of the artistic process as the artist’s intent. The folks responsible for Katie may not have intended to make a mean-spirited statement towards teen women, but that was the unfortunate message that I personally got as a viewer from their use of stereotypes. This is a very accurate statement. I never found this segment of the Animaniacs funny. This was just a teenage girl version of that Anthony kid from the twilight zone. It’s not really over thinking but just how it’s offensive and cringeworthy to people. It’s mental illness. I see a family trying to cope with a mentally ill teenager. I never interpreted show to mean that all or even most teenage girls were like this. I always thought it was something specific to Katie. Still not funny, but not a Tool of the Patriarchy either. That’s quite the interesting interpretation if i’m being honest. It’s not one I think I can see through the tropes of how most shows depict teens, but it is a refreshing perspective. I’d also like to point out that I never called the show a “Tool of the Patriarchy.” In fact, I praised the other segments for their progressive depiction of women in media. I just wanted to show that it was an unfortunate stereotype in an otherwise forward-thinking show. Also, yes – we are both in agreement that Katie is unfunny crap either way.